Apple took a stand in 2001 by stating that you owned your music. Now it's hoping you'd rather rent. Fourteen years ago—long before the meteoric rise of Justin Bieber from a demonic pit in suburban Canada—Apple did something remarkable: it said that the music you’d bought was yours and that you could do anything you liked with it. And what’s more, it would help. In February of 2001, just a few weeks and a quarter of a million downloads after it had launched iTunes, Apple introduced a new iMac, which was capable not just of ripping your CDs into iTunes where you could create your own playlists and albums, but also of burning them to disc. From 14 years away, since we’re all currently caught up in Apple Music and Beats 1, and since optical media is fading from relevance quicker than my pop music reference points, it might be hard to see why that was such a big deal, but you have to remember that this was essentially the first time home users had the chance to personalize their music easily, breaking it out of the prescribed album format, and crucially doing so in a format that was indistinguishable from what you’d buy in a shop. We’d been able to make mixtapes before, sure—hell, entire generations of children might never have been born were it not for that essential part of the mating ritual—and yes, for a while MiniDisc looked like it might take off as a credible, digital successor, but nothing before or after the CD was so simultaneously the default, de facto standard all commercial music was distributed on and the thing you could produce perfectly, trivially on your consumer-level Mac. It was wildly liberating, and Apple knew it. Here is its infamous “Rip. Mix. Burn.” commercial from the time, and although I winced on rewatching it at the Jamaican patois and the faint whiff of misogyny at the end, it completely nails the sense you got at the time of directing your favorite artists to do what you told them to do, not what they or their labels told you to do. Fast forward to today—or rather, Monday—and we get Apple having yet another go at disrupting the music industry. There are, though, some notable differences, not least the fact that its market capitalization—one measure of the value of the company—is literally a hundred times bigger today than it was when Rip, Mix, Burn was a thing. Consider too that today Apple is not even just part of the industry, it pretty much shaped the current industry—even is the industry. You could say that with Monday’s announcements it’s disrupting itself, which isn’t as silly as it seems; remember how the iPod killer turned out to be the iPod mini? 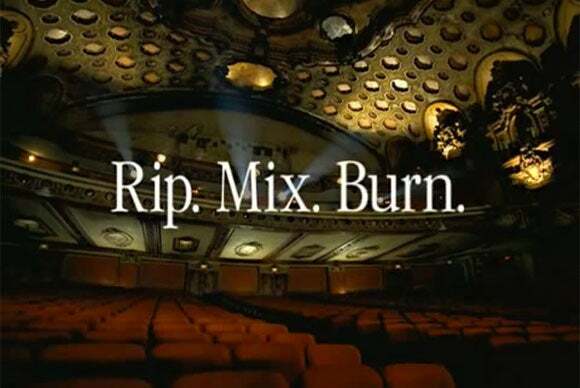 Back in the day, Rip, Mix, Burn was specifically cited by no less a copyright enthusiast than Disney when it accused Apple of encouraging piracy, but today the company is not a scrappy underdog, an unsigned band that can do anything because it has nothing to lose and can afford to affect a naive ignorance of the rules. It’s pretty much U2: big, rich, and interpreting its entrenched popularity as tacit permission to do whatever the hell it likes. And what it wants to do now, apparently, is push the idea of not owning music. If you were paying attention during yesterday’s keynote, you would have clocked, in one of the lush, excitable, wide-aperture videos even before we got to the One More Thing of the music segment, economist Joshua Gans saying “We don’t have to own our own music.” And lo, Apple Music was launched. And it was…good, I guess? Yes, I’m excited about how Apple Music will help me find new tracks that I’ll love, and no, of course I’m not going to be as short-sighted and lacking in curiosity as to ignore it. But by definition—because I met my wife at the same time as the Rip, Mix, Burn mentality took hold—there’s nothing that will beat that moment when, having carefully arranged a little over an hour of music into a playlist, having crinkled the wrapping off a jewel case, and having inserted a fresh, precious CD-R in my Mac’s drive, the brushed metal Burn icon would iris open, I’d click, and with a whrrrrreeEEEEEEE-ka-shnk-shnk-shnk, a perfect, personal CD would begin to be written.